Teachers are like camels. We can hold our water all day if we need to. It is quite a hassle to orchestrate a trip to the ladies room, so some of us wait as long as possible. When I need to leave, I have to let the aide know, or I have to call someone to come over and watch the kids if she is out. The kids pretty much have it figured out–a few times a day their teacher has to get a babysitter and “skip to the loo” across the campus. In an attempt to add some bit of tact to the whole process, I began to refer to the trip as “a meeting with an Egyptian cat” or having to “see a man about about an Egyptian cat.” The link here is vague at best. Someone in my life once said something about having to use the restroom “like an Egyptian cat” and it stuck. No other reason I can think of. This week, the 7th Grade Humanities class is studying ancient Japanese art. 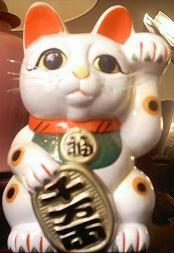 In my research I found that the Japanese cat has quite a history and is a symbol of good luck and prosperity. I have started to thread the Japanese Cat, or Maneki Neko, into my repertoire, but it has been slow-going. They are quite taken with the idea of my daily visits to see the Egyptian cat, and not so willing to add the Japanese cat to the mix. I suppose the lesson here is similar to the collection of blue things. Community builds in strange ways. Perhaps my references to feline urination aren’t exactly classy, but I think the camaraderie this has built might be worth a little low-class humor. Today I was working with my small English Language Learners group during PE. One of the students in my group suffers from selective mutism. M. is quite a sassy little thing, but very rarely speaks. While I respect her strength of character in controlling her life in this manner, you may well imagine that the required language development curriculum leaves little room for a student that doesn’t speak. For those of you who have not observed a lesson using typical Level A English Language Development curriculum, you will want to picture a very verbal, language and print-rich environment with a lot of TALKING, CONVERSING, DISCUSSING of various topics in day-to-day life. Anyhoo, a few minutes into class today, I realized I needed to use the loo. This is only problematic because all staff members were out at PE, and I knew there would be the added hassle of the students having to sit outside and wait for me while I “held my meeting.” I muttered to myself, “Oh no. I need to see an Egyptian cat.” M. smiled slyly, sighed dramatically, shut her computer and stood up. Showing that she a). knew the joke and b). knew the nuance of the issue that included her sitting outside to wait for me. If you add this to R.’s recognition of Egyptian cats living far away (see the Man on the Horse entry a couple of weeks ago), I have taught two students two things using this little euphemism. For this reason, I am counting this as a success.